Post by Creekside Gospel Music Convention. Pigeon Forge, TN. (November 5, 2013) – SGN Scoops and Creekside Gospel Music Convention was proud to present the 2013 Diamond Awards on Tuesday, October 29, 2013 at the Smoky Mountain Convention Center in Pigeon Forge, Tennessee. The gala celebration was hosted by Tim Lovelace and included appearances by Doyle Lawson and Quicksilver, Larry Ford, Jeff and Sheri Easter, Gerald Crabb and many others. The evening was also filmed by WATC, Channel 57 of Atlanta, Georgia, to be aired at a later date. Rob Patz, CEO of Coastal Media Group and publisher of SGNScoops, commented, “The Diamond Awards are always a special time of honoring the Gospel artists that fill our world with the music we love,” said Patz. “It’s great to take this opportunity to thank them and to be able to share the ceremony with fans across the nation and the world by internet. We are grateful to Tim Lovelace, our special musical guests and to WATC for recording the Diamond Awards. We had a great time at the ceremony and we hope everyone will tune in and watch!” The airing date of the Awards will be announced shortly. 8:30 pm- "Lou Hildreth Honors Ed O'Neal"
Please join us as we honor legendary Ed O'Neal for his many years of service in the gospel music industry. Lou Wills Hildreth will present this program along with co-host, homecoming artist, Larry Ford. Several artists are scheduled to appear as they congratulate Ed for his many accomplishments. Join us as Dr. Jeff Steele gives a word of encouragement. 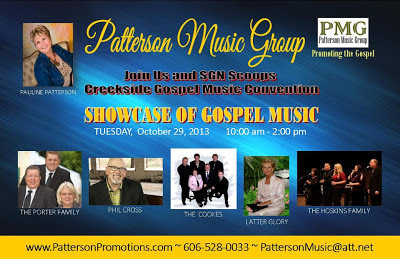 Patterson Music Group will present a morning showcase featuring some of Patterson's clients including the Boynton Chorus, Phil Cross, The Singing Cooks, The Partons, Tony Dean Family and many more. 8:30 pm- "The Diamond Awards"
We are excited to present Diamond Awards to artists that fans chose! We are excited for Doyle Lawson & Quick Silver, Gerald Crabb, Jeff & Sheri Easter, Phil Cross and more to participate in this year's Award's Show. Join Dr. Jeff Steel for a morning devotion. 2:00 pm- "Old Fashion Gospel Singing"
A special highlight of the convention will be having a large group of artists singing together familiar hymns and gospel songs. This will be a great afternoon with music, and a live band! Creekside Gospel Music Convention, Pigeon Forge, TN (July 16, 2013) – Creekside Gospel Music Convention attendees are buzzing about the addition of an exciting new event, Golden State Quartet’s Old Time Gospel Sing, to be held October 30th in beautiful Pigeon Forge, Tennessee. 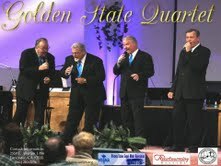 Golden State Quartet will bring their classic Southern Gospel style from California to the Creekside stage along with many of their industry friends, engaging the audience in a fun and nostalgic trip down a musical memory lane. On Wednesday, October 30th at 1:30pm, the stage at Creekside will be filled with a choir of Southern Gospel artists and a live band, with Golden State Quartet bringing the Old Time Gospel Sing to life. Special impromptu quartets and trios from the choir will sing Gospel favorites and hymns, filling the hall with the timeless message of the Gospel. Golden State Quartet and SGN Scoops encourages Gospel music fans across the country to plan today to attend the 2013 Creekside Gospel Music Convention. It will be a great week of the best in Southern Gospel music. Monday night will be a special night as Lou Hildreth honors the legendary Ed O’Neal. The 2013 Diamond Awards will be presented on Tuesday night. The Convention will also present the Pauline Patterson Showcase, devotions with Dr. Jeff Steele, as well as filling the mornings, afternoons and evenings with the greatest music in the world. 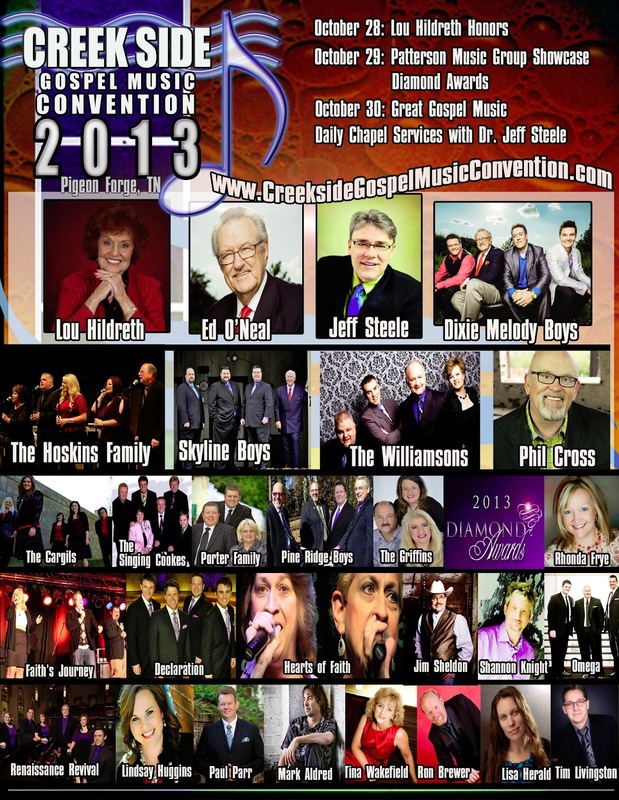 The Creekside Gospel Music Convention will be presented on October 28, 29 and 30th at the Smoky Mountain Convention Center, Pigeon Forge, Tennessee. Special rates are available onsite. Reservations can be by phone or online. By phone, call toll free at: 1-800-223-6707 or local call 865-908-3015. For online reservations, click onto http://www.smokymountainconventioncenter.com . 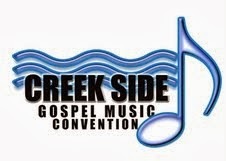 For more information regarding the 2013 Creekside Gospel Music Convention, please email Rhonda at rhonda@sgnscoops.com or Rob Patz at rob@sgnscoops.com . Five months away! Who’s counting? ME! I’m getting very excited about the Creekside Gospel Music Convention! We were very pleased with last years’ turn-out, especially considering it was our first convention. Being that 2012 was a learning experience for me, I’ve excited to work hard to make 2013’s Creekside even better. There may be a few minor changes here and there, but one thing we are definitely doing again is partnering with a local ministry called, “LIVE-IT.” Why? Because Creekside Cares! 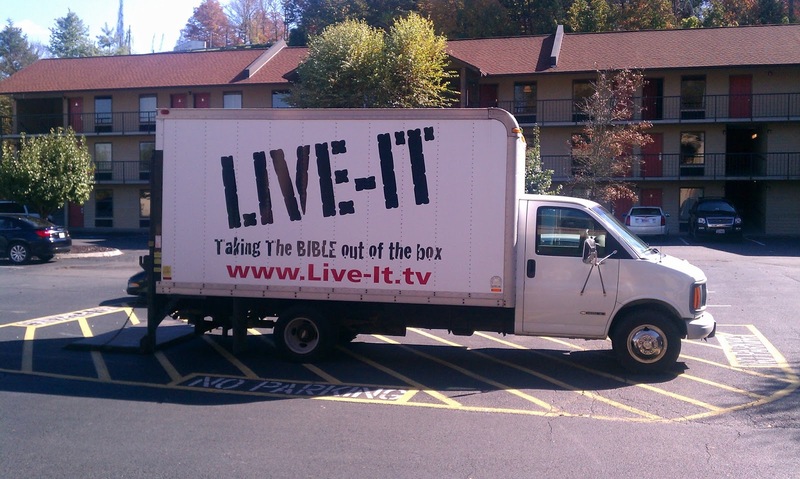 LIVE-IT is a non-profit organization serving the less fortunate in the Sevier and surrounding counties. projects giving many schools, church and community groups an opportunity to work together and serve. The projects benefit both those that give and receive. The recipients of LIVE-IT’S ministry are sometimes children, sometimes the elderly, disabled veterans, single moms or widows. Some projects include house, yard and car repair and some projects include gathering and delivering basic survival supplies. In order to fund these projects, LIVE-IT operates a thrift store and uses profits earned to purchase needed supplies. Maybe you’re asking- “What does this have to do with gospel music?” I’m glad you asked! By becoming involved with a local ministry during our stay in Pigeon Forge, we’re putting our message that we proclaim into action! I like to say, “We’re putting hands and feet on the songs we sing!” We can sing about loving God and loving people all day long, but this is a GREAT chance to show it to those outside the doors of the Smoky Mountain Convention Center! some of our guests will be traveling long distances, but ANY donation is appreciated! I was really proud of the participation we had last year. In fact, LIVE-IT later received donations from guest that had planned on coming, but got caught in the bad weather and couldn’t make it. Many of our guests gave items. So…. Come on, Southern Gospel artists and fans… Let’s stock the LIVE-IT thrift store and leave Pigeon Forge a better place! showcase, devotions with Dr. Jeff Steele and filling the mornings, afternoons and evenings with the greatest music in the world. Whew! It’s going to be awesome! call toll free at: 1-800-223-6707 or local call 865-908-3015. Online Reservations- go to http://www.smokymountainconventioncenter.com . honda@sgnscoops.com or Rob Patz at rob@sgnscoops.com. The Creekside Gospel Music Convention got started off right with prayer and then announcements. evening with a beautiful piano prelude. PTL, Rick Francis of Singing News Magazine and John Lanier of Christian Voice Magazine. Great Gospel Music followed Ms. Lou’s Celebration with performances by Declaration Trio and more. It was truly an incredible first day at Creekside! Early Tuesday morning, a few brave souls braved the chilly weather and enjoyed a chapel service. continued throughout the afternoon, right up until time for the Diamond Awards Show. more kept the audience blessed and entertained leading up to the Diamond Awards Show. The Porter Family, and Faith’s Journey. Times ezine, and publicity for artists on the radio promotions roster. Patterson Music Group’s artists will take the stage from 10:00 AM until 2:00 on Tuesday, October 29.
as all other events are free to the public. send the link in newsletters and post it on websites and all social media outlets. profits earned purchases needed products and supplies to those in desperate need. Music Convention, please email me at Rhonda@sgnscoops.com or Rob Patz at rob@sgnscoops.com. Coastal Media Group and SGNScoops is excited to announce that the 2013 Diamond Awards nomination period begins February 18, 2013! Everyone who enjoys Southern, Country and Bluegrass Christian music is encouraged to nominate a top artist who they feel is the finest talent in their category. The ten artists receiving the most nominations in each category will be voted upon to create a top-five artist list. 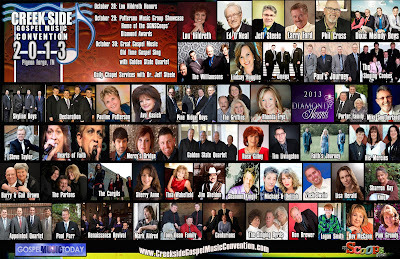 The top-five artists will then be voted upon and the artist who achieves the most votes in their category will be awarded a Diamond Award at the gala ceremony to be held at the Creekside Gospel Music Convention on October 29, 2013 at Pigeon Forge, Tennessee. living performer who has made the greatest contribution to Southern Gospel music over a career spanning 25 years or more. TRADITIONAL MIXED GROUP OF THE YEAR: A group of any number with male and female vocalists. Must be full-time Southern Gospel artists. TRADITIONAL QUARTET OF THE YEAR: A traditional male group, four vocalists featuring four-part harmony. Must be full-time Southern Gospel artists. TRADITIONAL TRIO OF THE YEAR: A traditional group, three vocalists featuring three-part harmony. Must be full-time Southern Gospel artists. TRADITIONAL DUET OF THE YEAR: A traditional group featuring two vocalists. Must be full-time Southern Gospel artists. TRADITIONAL FEMALE SOLOIST OF THE YEAR: A full-time female Southern Gospel artist recording as a soloist. 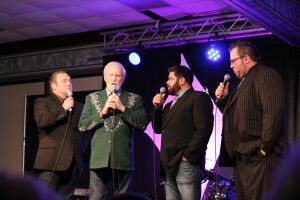 TRADITIONAL MALE SOLOIST OF THE YEAR: A full-time male Southern Gospel artist recording as a soloist. CHRISTIAN COUNTRY GROUP OF THE YEAR: A group of any number with male and female vocalists. Must be full-time Christian Country artists. CHRISTIAN COUNTRY FEMALE ARTIST OF THE YEAR: A full-time female Christian Country artist recording as a soloist. CHRISTIAN COUNTRY MALE ARTIST OF THE YEAR: A full-time male Christian Country artist recording as a soloist. BLUEGRASS GOSPEL ARTIST OF THE YEAR: A solo artist or group of any number with male and female vocalists who are full-time Bluegrass Gospel artists. SUNRISE AWARD: A new or developing full-time artist who has seen major growth in their career, as evidenced in airplay or personal appearances during the past year. Nominees in this category must have released their debut single only two years prior to the eligibility date of January 1, 2013. This award is also a once-in-a-lifetime honor. This award can be given to any artist in the Southern, Country or Bluegrass Christian music genres. SONG OF THE YEAR – This song must have been recorded by a full-time Southern, Country or Bluegrass Christian music group or artist, released nationally as a single during the eligibility period of February 2012 to January 2013. ALBUM OF THE YEAR: This album must have been recorded by a full-time Southern, Country or Bluegrass Christian music group or artist, released nationally during the eligibility period of February 2012 to January 2013. ANTHONY BURGER INSTRUMENTALIST OF THE YEAR: A full-time artist in Southern, Country or Bluegrass Christian music who plays any musical instrument. 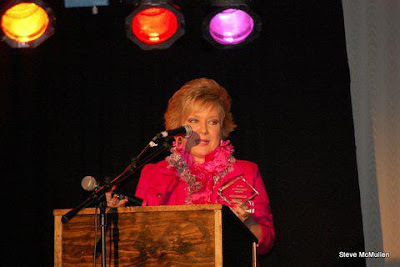 DOTTIE RAMBO SONGWRITER OF THE YEAR: A nationally charting songwriter in Southern, Country or Bluegrass Christian music whose songs are recorded by Southern, Country or Bluegrass artists. VIDEO/DVD OF THE YEAR: A short form video or a DVD released within the eligibility period of February 2012 – January 2013, featuring a Southern, Country or Bluegrass Christian music artist or group. FAVORITE ARTIST WEBSITE: An independent, artist-owned website that showcases a full-time Southern, Country or Bluegrass Christian music artist. FAVORITE INDUSTRY WEBSITE: A news, magazine, supporting business, or event that supports or promotes the Southern, Country or Bluegrass Christian music industry. PAUL HEIL AWARD (Broadcasting): A disc jockey/radio or television host that supports or promotes Southern, Country or Bluegrass Christian music. booths and an auditorium with intimate seating, this lovely venue also offers hotel rooms at very reasonable rates. and industry members at the 2013 Creekside Gospel Music Convention. For more information contact Rob Patz today at rob@sgnscoops.com or 360-933-0741.